Inventor of the Wet Collodion Process. Frederick Scott Archer made what was, arguably, one of the most important contributions to the development of photography in the first twenty years of its existence. However "George Eastman House, International Museum of Photography" and "The Collodion Journal" arranged a conference and exhibition in September 2001 to celebrate the 150th. anniversary of the first publication of his process in the March 1851 issue of The Chemist. Sadly this important anniversary appeared to pass unnoticed by the photographic community in England. Much of Archer's life is undocumented. After he died, some details of his early life were recounted by his wife, Fanny G. Archer, (Frances Garrett Archer). He is said to have been born the son of a butcher in Bishop's Stortford and this belief is an early and much repeated one, however there is no documentary evidence to support it. The 1841 census, oddly, gives Scotland as his place of birth. The 1851 census, offers Hertford as his birthplace, also the inscription on Frederick's memorial stone gives his father's name as Thomas Archer "formerly of Hertford". Interestingly Fanny's entry in the 1851 census gives Bishop's Stortford as her birthplace. I am deeply indebted to Dr.Stefan Hughes who, currently writing a book on the History of Astrophotography, called ‘Catchers of the Light’, has generously allowed me to quote from his research on the Archer family, and has provided an Archer family tree. It is generally believed that Frederick was born in 1813, but although his death certificate might be thought to cast some doubt on this date, it is fully born out by the 1851 census and the inscription on his memorial stone. He lost his parents as a child and was brought up by distant relatives and friends. Archer specialized in coin appraisals and became interested in their artistic qualities, which led to his work in sculpture. Friends helped him set up a studio at Henrietta Street in London where he sculpted busts of well-known people, including the Marquis of Northampton, Lord Albert Conyngham, and William Smith, of the National Portrait Gallery. In 1847, he turned to photography as an aid in his portrait sculpture work. In November of that year, he learned the calotype process from his medical attendant, Dr. Hugh W. Diamond. Trying to reduce the amount of texture and unevenness inherent in the paper used for calotype negatives, he tried spreading collodion on paper, but could not get the collodion to adhere to the paper after the necessary washing. Later, after using a variety of substances as binders including zyloldin, starches, fine paper pulp, tanno-gelatine solutions, and albumen, Archer tried collodion as a substitute for paper. By this time, he was devoting all of his time to photography and working out of his new studio at the back of his house on Great Russell Street in Bloomsbury. Finally, in 1849, he made a breakthrough when he tried coating a glass plate with iodized collodion and exposing it while still wet. In May and June 1850, Archer published an article about the use of pyrogallic acid, a more active developer than gallic acid for photography, in The Chemist. In September of that year, he showed details and pictures he made by the wet collodion process to his friends. Morgan Brown wrote that in 1850, on Michaelmas Day, (September 29) he met with Archer and Diamond at the Wandsworth Asylum, where Archer made two collodion images. Archer waited to publish his process until he could obtain more consistent results. In his first treatise, published in The Chemist, (March, 1851) he discussed the advantages of collodion and offered detailed instructions on the process. William Henry Fox Talbot claimed that Archer's process was covered by his own Calotype patent, Talbot was particularly aggressive in issuing public warnings and for awhile was successful in suing photographers who used the collodion process without obtaining a license from him. One photographer, Thomas Sims said Talbot's solicitor asked for a sum of 350 pounds for licensing his two studios. Sims refused, saying the amount was equal to his rent, and would put him out of business. An injunction was issued, and he was forced to close his business anyway. In 1853, Talbot had brought suits and injunctions against a number of photographers, including one named Henderson. A photographer reacting to the Henderson case, wrote to the Journal of the Photographic Society in June, 1854, "Talbot has as much right to prevent Henderson, or anyone else, taking portraits by the photographic or collodion processes, as he has to prevent Sir John Herschel from looking at the moon through a telescope" . Finally, Talbot brought suit against a photographer named Martin Silvester La Roche. The court concluded, in a milestone ruling that while Talbot was the inventor of the calotype process, La Roche was not guilty of infringing on the calotype patent by taking collodion portraits. In 1854 Archer published a manual on the process entitled "THE COLLODION PROCESS on GLASS." Ultimately, Archer was deemed the inventor of the collodion process because he was the first to publish a formula and method that others could follow. And follow they did, by the tens of thousands. The process became so popular that Talbot did not bother to renew his calotype patent, because he knew it would not bring him any financial advantage. Ironically, Daguerre died the same year the collodion process was announced by Archer. As if the baton had been passed, within a few years the daguerreotype went out of fashion in favour of collodion. A friend, W. J. Taylor encouraged Archer to patent the collodion process before publishing it, but he dismissed the idea. His friends were also unsuccessful in encouraging him to call images made with collodion, "Archerotypes." Although he patented several of his other inventions, such as the gutta percha method for stripping film (in 1855). he died before he could reap the benefit. Why wasn't Archer more outspoken? We know that Archer was not physically strong, and by one account, he suffered from enlargement of the liver. The British Journal said he was "a man of very obliging disposition." Archer's selflessness contrasted greatly to Talbot's behaviour. The Liverpool Photographic Journal, 1856, said, in true British form, "Mr. Archer's disinteredness cannot be too highly or substantially complimented. Had the secret of the medium employed in the production of his pictures been kept, its use under restrictions, merely allowed, he would have unquestionably maintained in his own hands a great power, which might have conduced to his own pecuniary advantage... -the discovery might have been worth a fortune... In every direction indeed in which we turn, we perceive alike its value and the generosity which bestowed it - free as air - on the public, for the public good." Archer is recognised as the inventor of the wet-plate process because he understood the significance of collodion as a photographic binder and was the first to put together a workable method and publish it. He set a new tone in the world of photography by sharing his findings openly without obtaining a patent. His nature, and perhaps his health, prevented him from engaging in a war of egos, or, from demanding compensation, risking his own financial downfall. The Manchester Photographic Society attempted to raise funds for him and his family, but as of March, 1857 came up with just 34 pounds, 13 shillings. Archer died virtually penniless on the 1st. May 1857*, and was interred in the family grave in Kensal Green Cemetery, London. Upon his death, Archer's family was awarded a Crown pension of 50 pounds per year and the children were given £767, collected by the Photographic Society. The following March Fanny died. Of the three orphaned children, only Alice survived to adulthood, and it is unknown if she ever married and had children of her own. The three daughters are to be found in the 1861 census at a school in Kensington. To the Sons of the Sun. To see an example of Archer's work along with a modern photograph of the same scene go to the Sparrow's House page. 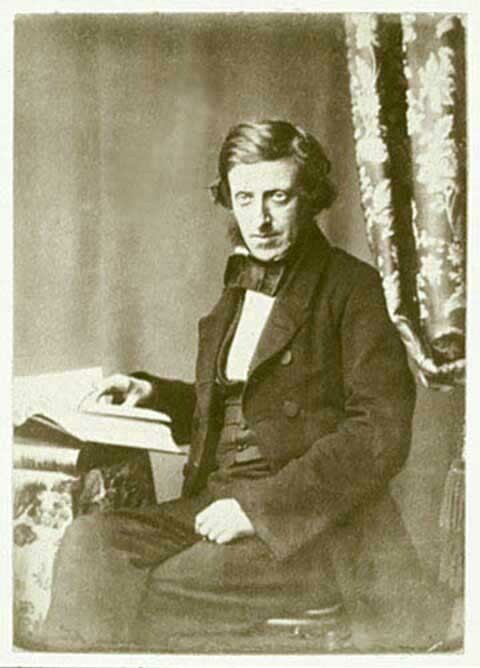 I am indebted to France Scully Osterman and Mark Osterman for allowing me to use articles from their invaluable periodical, The Collodion Journal, in the composition of these pages devoted to Frederick Scott Archer. If you are interested in the wet collodion process please have a look at my web site which records my own adventures with the process. This site was contructed by Seán MacKenna to honour the name and to perpetuatethe memory of Frederick Scott Archer, and he alone is responsible for any mistakes, inaccuracies or errors of understanding that may occur in these pages. Both the text and the illustrations on this site are the copyright (2001) of Seán MacKenna, and the use of any of this material without prior permission is strictly forbidden.